If you love fresh vegetables and other garden produce and would like to grow your own vegetables & herbs, you should consider gardening at home. If you have limited gardening space but still want to grow your own vegetables and herbs, starting a container garden could be your solution. Container gardens don’t need to be boring; these are just a few of the items taking up space in your home or garage that can be re-purposed to create a container garden. Old filing cabinets can make good container gardens and will easily grow vegetables and other garden produce. The key to success is to get a cabinet with no dents and with a flat bottom. Add wheels and paint it your favorite landscape color or even add a mural. Empty cabinets can be heavy and become much heavier when soil is added to them. Adding wheels allows you to change their location during the day or as the season change, or even move them inside during the winter. 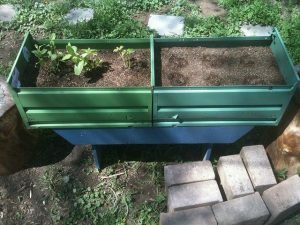 A metal tub garden is similar to a filing cabinet garden, but it does not require wheels. But you need to rememb er that metal can heat quickly and dehydrate the plants. Remember to water it adequately if the tub is placed in a full sun location. There are countless ways to stack cinder blocks and create your own container garden. 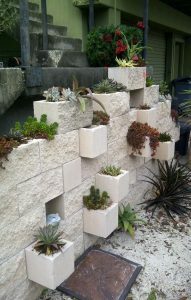 For a vertical style garden start by purchasing several single and dual cinder blocks. It is best to start small then add to the garden over time. In addition to the blocks you will also need to purchase metal flashing rectangles, a caulking gun and landscape adhesive. These supplies are used to seal one open side of the blocks so they can hold soil and plants. The adhesive should be used to hold the blocks together as the garden is created. Start by identifying all the cookware you no longer use and you’ll be well on your way to creating a simple but effective garden. 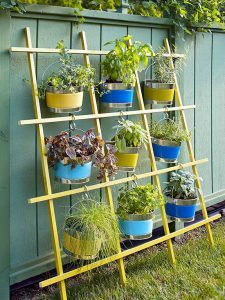 Plant a different vegetable or plant in each piece of cookware then hang or stack them on the trellis. They will give your deck, patio or yard a unique look and are easy to maintain. Container gardening with unique objects lets you grow your own food while creating a unique look on your patio, deck, yard or even in your apartment. Plants with shorter roots normally work best in container gardens but other plants can thrive in containers as long as they have adequate space for their roots. Background information for this article was provided by MCG BioMarkers. Visit MCGBioMarkers.com.